For years, Celeste and her father have taken shelter high in the treacherous mountains. They’ve been struggling to survive alone since their family succumbed to the same sickness that conquered the world. But Celeste is hungry and restless, eager for a return to civilization. She dreams of what is left. With dwindling supplies and an aging cow, she remains uncertain of their survival through the upcoming winter. Especially as the wolves creep closer – they’re starving, too. Relying on an old map from her estranged uncle, she begins her journey through the ashes of society. But monsters form in the shadows, stalking her every step, indistinguishable from the maddened survivors she encounters through abandoned cities and highways. She quickly realizes the world is perilous for a girl alone. Friend and foe become creatures that hunt her through the night. Blood and violence are ingrained in her soul, blemishing her innocence. As every death stains her hands, her humanity slips away, replaced by the wolf inside. A totally mesmerizing and intriguing book. Very unique and distinct. At times very dark, dismal and daunting but certainly never dreary. The author uses very powerful imagery to great affect. As a reader you become totally involved if never quite sure about the tenuous plot and where it is leading. The electrifying storyline has a female leading character, one who slowly evolves into a compelling and dynamic hero before our eyes. As an avid reader who prefers the written word I have to say this breath taking novel had me longing to see it in film form I was so awe struck by the mental images this accomplished author conjured up. If you are looking for an exciting novel, that is both thought provoking and provocative then this novel will not disappoint. 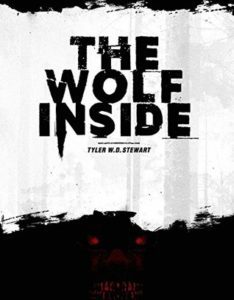 Tyler is an aspiring writer from western Canada, striving for a degree in English. With a penchant for strange horror and science fiction, he began crafting his own dystopian series in his spare time, but now devotes all precious hours of a day to writing an assortment of genres. He is currently completing the second installment to The Wild Hunt trilogy, Wolf Blood.